Holy Thursday, known as Velykyi Chetver or Strasty Khrysta, is a day to commemorate Christ’s passion. In doing this, everything must be washed or cleaned, and all food should be cooked or baked. All of the household work must be completed on Holy Thursday, as after Holy Thursday there is no work permitted. Time spent after Holy Thursday is dedicated to various religious services. On Good Friday churches will set up a representation of Christ’s tomb for churchgoers to worship at. This is known as a plashchenytsia. Holy Saturday Depending on the region you practice, some families have their basket blessed on Holy Saturday, while others have it blessed on Easter morning. Traditional Easter baskets typically include Paska, Ukrainian babka, pysanky, krashanky, maslo and many other regional specialties are included in a typical basket. A decorated beeswax candle, which is lighted during the blessing in church, is also included in the basket. On Easter Sunday, churchgoers will greet one another at mass with the saying, “Khrystos voskres! Voistynu Voskrese!” which means “Christ is risen! Indeed He is risen!” After mass, families will gather to eat the delicious food from the basket that has been blessed either that morning or the morning prior. The contents are left on the table throughout the day to munch on while everyone rests and relaxes. Arguably one of Ukraine’s most famous Easter traditions is the intricately decorated Easter eggs known as ‘pysanka’. The word pysanka comes from the verb pysaty, “to write”. Creating pysanka is an extremely complicated endeavor and they are usually created during the last week of Lent. The smoothest and best-shaped eggs are used to make pysanka. A stylus is often used to ensure and perfect the clean lines and intricate patterns on the eggs. Pysanka are given to friends and loved ones to represent the gift of life, and are usually decorated to match the personality of the receiver. 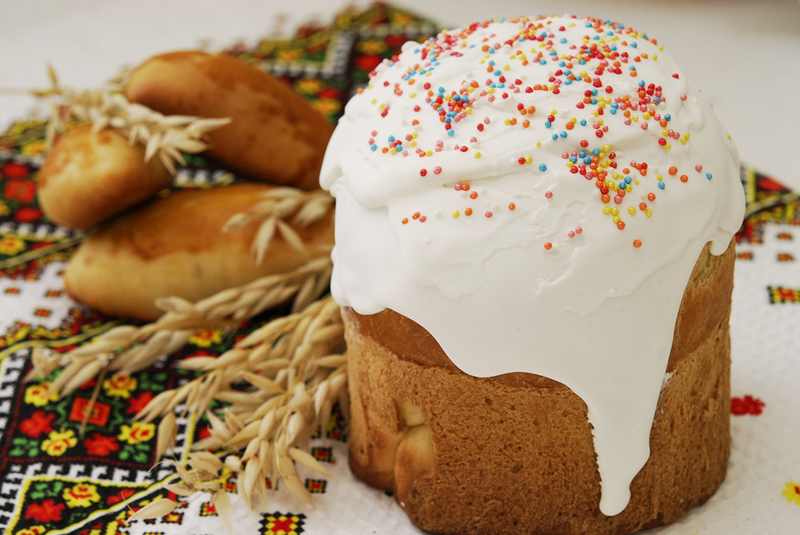 Paska is beautifully decorated Ukrainian Easter bread. Tradition states that the baker must keep their thoughts pure and the entire household quiet in order to ensure the bread bakes properly and becomes its fluffiest. This means that no one, not even neighbours or friends are allowed to enter the home during its baking! The intricate décor on the bread represents welcoming imagery of springtime. Some Ukrainian traditions insist upon three loafs: one to honour nature, another to honour the dead and a third to honour those on earth. What are your favourite Easter traditions? Share with us on Facebook!